← Ten on Tuesday, the holiday entertainment edition. I turned in the hat and mittens yesterday to the yarn shop that is collecting them. The sun cooperated by shining in the morning; I wanted to get some photos of the hat with a low-angle sun so that the pattern stitch showed up really well. Yarn: Berrocco Vintage (50% superwash wool / 50% acrylic) leftovers from my colorful socks and the recent baby sweater. The lavender is Louet Gems superwash worsted leftover from my kimono sweater. 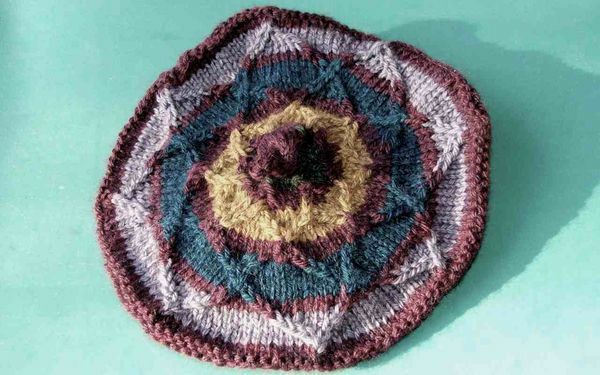 Pattern: Sunflower Tam from Knitting Nature by Norah Gaughan. Mods: The pattern calls for casting on 90 st in worsted weight yarn on US#6 needles for the child's size. I have knit a lot of worsted-weight hats, and that seemed to me a bit large for a child's size so I used #5 needles instead. The Berrocco is a light worsted weight, so it all worked out fine. 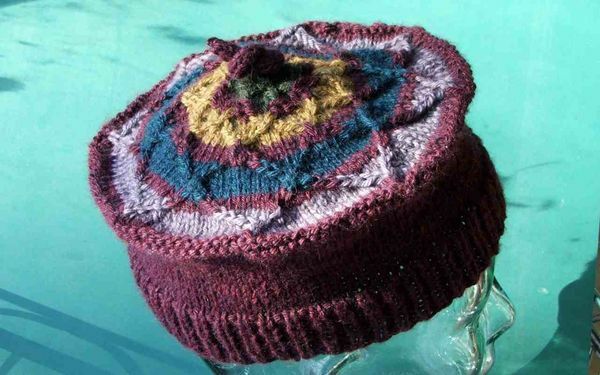 Looking at the 400+ tams on Ravelry that have been made from this pattern, I noticed a lot of comments that the hat was too large. Yep, it would have been. 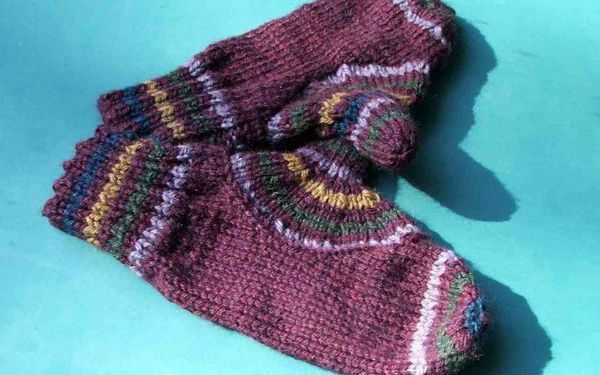 Pattern: Target Wave Mittens from Knitting Nature by Norah Gaughan. This entry was posted in Accounting, Community knitting, FO, hats, Mittens. Bookmark the permalink. 0 Responses to WIP FO Wednesday. Really gorgeous! Nothing wrong with a wonky stitch–most people have wonky heads, anyways. I love them! Don’t let Mr. M anywhere near them – he would say naughty things about those mittens. He is naughty like that. Hm. Love that hat… have always wanted to knit those mittens… have the book… best get to it one of these days! I like yours!! They’re wonderful! The mittens are adorable and the hat is kind of fabulous! I see no wonky. I love the traveling stitches on that tam! Really cute, what unusual patterns. What, your thumbs don’t stick straight out to the side? Phyllotaxis? I had to google. Love to learn a new word. Great looking set. Some little girl is going to be very happy. I love the mittens 🙂 That thumb is just remarkable and I want to try it.